Ludwig Meidner was born in Bernstadt (now Bierutów, Poland) and studied in Breslau, Berlin and Paris. Apprenticed unsuccessfully as a stonemason, he then worked as a fashion illustrator. In 1912 he began the Apocalyptic Landscapes series anticipating the carnage and destruction of the First World War and exhibited with Die Pathetiker group in Herwarth Walden’s influential gallery, Der Sturm. An avowed pacifist following military service, Meidner painted Jewish religious and mystical works, Rembrandt-inspired self-portraits, and portraits of leading expressionists, Dada writers and poets. With rising anti-Semitism in Berlin, he and his family moved to Cologne in 1935, where he worked as a drawing teacher at a Jewish school. In 1937 he was included in the infamous ‘Degenerate Art’ exhibition. Immigrating to England in August 1939, he was interned from 1940–41: first at Huyton Camp, Liverpool, and then in Hutchinson on the Isle of Man, known as the ‘artists’ camp’ for its roster of notable artist-internees. His wife, Else, his former pupil and a painter in her own right, became a domestic during this period. Fellow internee, artist Hellmuth Weissenborn (1898–1982) noted that of the 2,000 men in Hutchinson – ‘Germans, Austrians and a few Italians, people of all social circles’ – 90% were Jews’. Hence, for the devout Meidner, internment developed into a positive experience. Compared to the poverty and isolation of exile, it was a safe, religiously tolerant and intellectually stimulating environment, providing Kosher food and the means to continue drawing, such that, prior to his release, Meidner even asked to stay on. 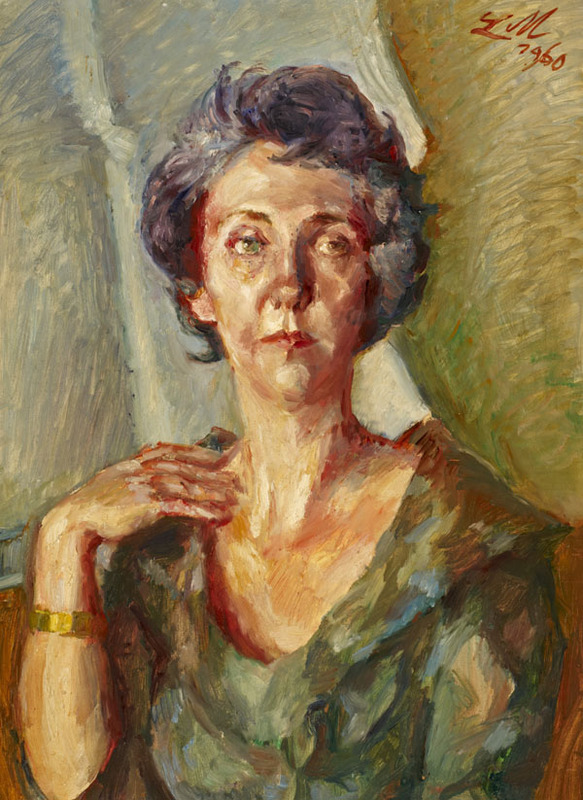 Despite receiving little recognition as an artist, Meidner remained in London after the war, taking odd jobs and dependent on support from the émigré community – particularly art historian J. P. Hodin. Participating in some Jewish artistic circles, he unsuccessfully attempted to establish a Jewish art society with fellow émigré Jankel Adler. Meidner also joined the Ohel Club in Gower Street organised by émigré brothers Alexander and Benjamin Margulies for Jewish refugee intellectuals. Josef Herman recalled artist members including Adler, Marek Szwarc, Bloch and Bomberg. Alexander Margulies also provided a conduit to the Ben Uri Art Gallery, where he became Chairman, and where Meidner exhibited Memorial to Death and In a Concentration Camp, his haunting response to the Holocaust, in the exhibition Subjects of Jewish Interest in December 1946. In late 1949 his sole exhibition in exile was a joint Ben Uri show with Else, a show whose limited success he likened to a ‘second-class funeral’. Meidner finally returned alone to Germany in 1953 to renewed acclaim and awards. A joint retrospective of work by husband and wife was held at Ben Uri in 2002. Lilo Gwosdz was an Austrian portraitist, who also had a celebrated career as a fashion and advertising photographer. Meidner’s typically free brush work can be seen in the background behind her and in the patchwork colouring that makes up her elegant dress.